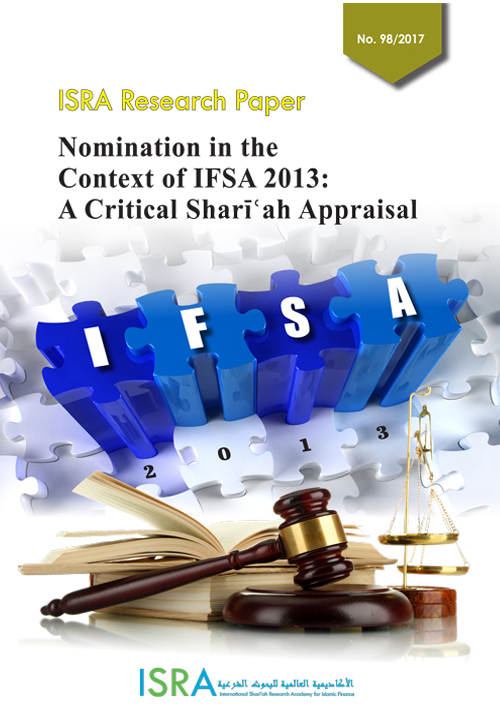 The research objectives are two-fold: (i) to investigate the Sharīʿah basis of Schedule 10 of IFSA 2013; and (ii) to survey the practice of nomination among takāful operators in Malaysia. After reviewing the main literature on nomination in Malaysia, it is found that most of it was written before the Islamic Financial Services Act 2013 (IFSA 2013). Moreover, the discussion of fiqhī issues such as possession of takāful benefits and when it actually occurs tends to be oblique. The reviewed literature did not actually link the issue of ownership of the takāful contribution with the issue of ownership of the takāful fund. This linkage is necessary to validate or invalidate the ownership of takāful benefit based on conditional hibah (gift). why the transfer of takāful benefit can take place without physical or constructive possession in the Malaysian practice. The research began with a comparative analysis of nomination between conventional and Islamic insurance. While the two systems converge in the objective of nomination, they differ in the contractual arrangement and entitlement. Seen as a right in both systems, this research has questioned the legitimacy of this right from the Sharīʿah perspective. the capacity of the nominee. The second part of the research questioned the Sharīʿah and legal basis for the minimum age set for exercising the right of nomination in Malaysia. The age specified in Schedule 10 is 16 while the Age of Majority Act 1971 set the age of majority at 18. On the other hand, the uṣūlī doctrine of Islamic legal capacity sets it at puberty for certain actions but identifies the characteristic of rushd (sound intellectual faculty) as the threshold for financial dealings. The question remains standing as to the basis for setting the age of nomination at 16 in Schedule 10. The third part, which is the most crucial, examined the effect of nomination as promulgated in IFSA 2013. Discussing the capacity of the nominee as an executor, this research advances the concept of al-wasiyy al-mukhtār (the selected executor) as the most suitable concept to justify the capacity of execution enshrined in IFSA 2013. As for the nominee as a beneficiary, the research examined the conditional hibah principle in relation to ownership of tabarruʿ, the takāful fund and the takāful benefit. On the basis of the researchers’ argument that the takāful participant loses ownership of his contribution to the tabarruʿ fund, the legitimacy of making a conditional hibah is highly questionable from the Sharīʿah perspective. The debate about the ownership of the takāful fund led the researchers to conclude that the takāful participant cannot make a conditional hibah for assets held in the risk fund since it is a separate legal entity. The takāful fund is the entity that is legally supposed to make the nomination based on the proposal of the participant, which is not binding on the takāful fund. he has no right to make a nomination therefrom. The research also investigated the ruqbā and ʿumrā arrangement used by the Shariah Advisory Council of Bank Negara Malaysia (SAC-BNM) as the basis for nomination. Based on the in-depth analysis of ʿumrā and ruqbā and their applicability in takāful, the researchers are of the view that, in the context of takāful, the participant as a donor would put a condition that if he died the takāful benefits would go to the beneficiary. However, if he survived the takāful benefits would be deemed as the donor’s property. This arrangement is more suitable to ruqbā rather than ʿumrā. This detail is applicable to the assets of the investment fund as they belong to him, and he has the discretion to deal with them on a ruqbā or ʿumrā basis. The concept of hibat ruqbā and hibat ʿumrā as justified by the SAC-BNM resolution may not be strong Sharīʿah evidence for nomination. Premised on this conclusion, the conditional hibah principle may still be in need of further Sharīʿah substantiation.